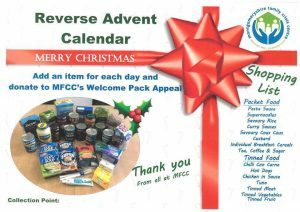 MFCC’s annual reverse calendar appeal will be starting at the beginning of December, are you interested in helping? Perhaps you could act as a collection point. Items collected are all part of MFCC’s emergency Welcome Packs for men, women and children who enter our refuges to help get them through the first couple of days.